In certain instances such as after a failed seeding, winterkill or in an attempt to thicken thinning stands, producers may be interested in following alfalfa with alfalfa. This practice has met with varied success due primarily to compounds produced by older alfalfa plants, which inhibit the growth of young seedlings. This process is known as autotoxicity. In this Focus on Forage, we will discuss what causes autotoxicity, factors that affect it, and ways to reduce the effect. Plants produce a wide range of chemicals aimed at defending them from attack by insects and diseases. These compounds are called secondary metabolites, as they have no metabolic function in the plant except as a defensive mechanism. Among these chemicals are some that inhibit the growth of other plant species. The production of compounds by one plant species that are toxic to another is known as allelopathy. The production of chemical compounds by a plant that are toxic to members of the same species is known as autotoxicity. Plants produce these compounds to help “carve out” a space for themselves and reduce competition from other plants for water, nutrients and light. Alfalfa is a plant species that exhibits autotoxicity. There are a number of potentially autotoxic chemicals produced by alfalfa, one of which is called medicarpin. This compound is present throughout the plant but is more concentrated in top growth than roots. It is a water soluble compound that leaches readily into the soil from both decomposing plant material and growing plants. Once a stand of alfalfa is killed, whether by plowing, spraying or even winterkill, the autotoxic compounds are released into the soil environment. How long they remain and what affect they have on a new alfalfa seeding is a function of soil type, temperature, and amount to rainfall. On sandy soils where the toxins are more available and more easily taken up, the effects are more acute but are less persistent due to leaching. High rainfall leaches the toxins more rapidly than low rainfall. On heavier textured soils, the toxins are more tightly adsorbed to soils colloids and less prone to leaching. Consequently, the effects are less pronounced but are longer lasting. These compounds are microbially degraded and so conditions that favor microbial growth (warm, moist versus cool, dry soils) reduce the persistence of the toxins. Tillage affects the level of toxin in the soil. More aggressive tillage will better mix and dilute the toxins. Wisconsin research showed the effects of autotoxicity to be greater in no-till fields than those moldboard plowed. 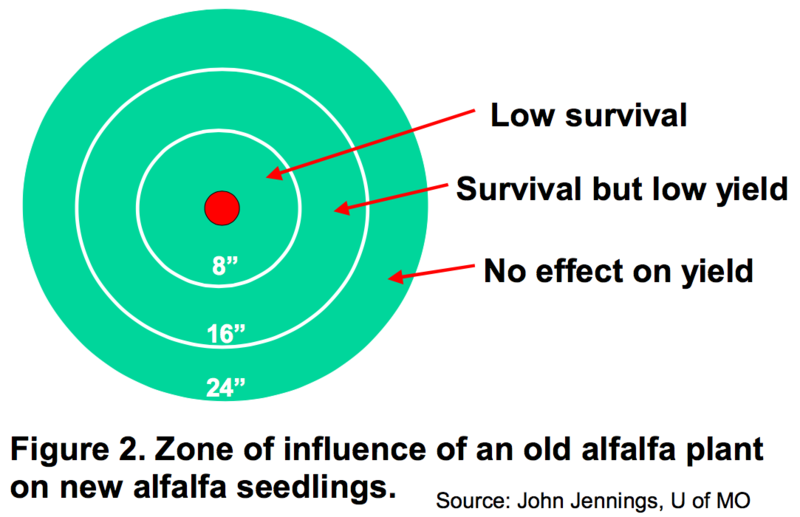 Alfalfa that was planted in spring after fall killing an old alfalfa stand showed yield reductions of 30% when seeded conventionally and 40% when no-tilled (1) (Fig.1). The age of the existing alfalfa stand will affect autotoxicity. Younger plants (those one year old or less) contain less toxin than older plants. This means that failed seedings or even new seedings that winterkill can be seeded back to alfalfa with little yield reduction. 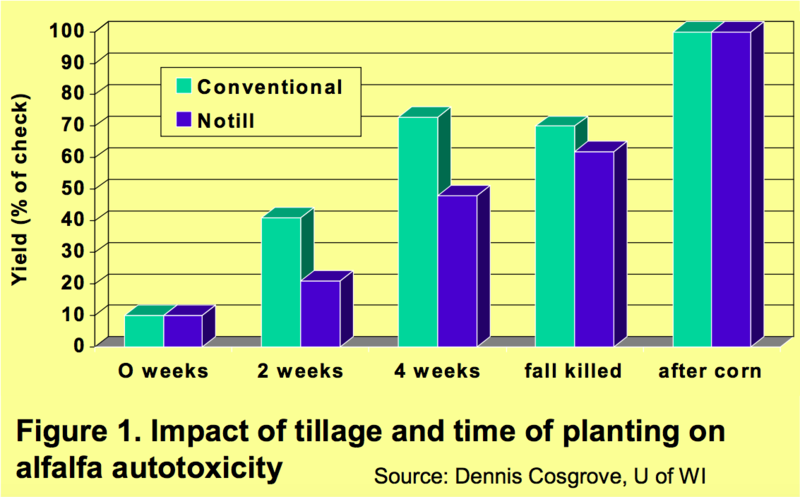 Density of the previous alfalfa stand also impacts the concentration of toxins in the soil. Studies at River Falls showed stands densities as low as 30 stems/ft2 exhibited autotoxicity similar to stands with 70 plants/ft2. It is not known what the thresholds is below which autotoxicity is not a concern. The time interval between eliminating an old stand and planting a new one has an important influence on the effects of autotoxicity. Research in this area is somewhat conflicting. Studies in Michigan showed that a three-week waiting period was all that was required to eliminate any yield decreases from autotoxicity (3). In Missouri yield was reduced 8% if alfalfa was seeded back within three weeks (2). Wisconsin studies have shown yield reductions of 30% and 70% when alfalfa was seeded 4 weeks or 2 weeks after plowing down old alfalfa plants (1) (Fig. 1). This effect was even more pronounced (50% and 80%) when the new alfalfa stand was established without tillage. How does autotoxicity affect plants? Autotoxicity affects the development of the seedling root system. Toxins inhibit the ability of the root radicle to elongate. This results in reduced seedling emergence. Emerged plants are stunted and may show purpling because of their inability to take up adequate amounts of phosphorus. Surviving plants will develop a secondary root system that is shallow and more highly branched than that of an unaffected plant. This smaller root system reduces the plant’s ability to take up water and nutrients. This affect will persist throughout the life of the plant. Stands affected by autotoxicity during the seedling year will have reduced yields not only in that year but in subsequent years as well. Studies in Missouri and elsewhere have documented reduced yields up to three years after stand establishment. How can autotoxicity be reduced? The best way to avoid autotoxicity is to rotate to some other crop such as corn for at least a year before seeding the same field back to alfalfa. This gives the toxins time to be degraded, leached, or otherwise removed from the soil environment. If alfalfa must follow alfalfa, the best choice is to kill the old alfalfa in the year prior to seeding. The degree of toxicity is directly related to the amount of time between killing the old stand and establishing the new stand. If alfalfa must be planted in the same year an old stand is killed, a late-summer seeding represents the best option. Planting a crop such as oats, sorghum or other early harvested crop may help in that some of the toxin may be removed through plant uptake. If alfalfa must be planted in spring following a spring killing of an old alfalfa stand, wait at least three weeks before reseeding. In all of the scenarios discussed above except rotating out of alfalfa for at least one year, some yield reduction will likely be experienced. In the case of a spring-kill followed by spring replant, serious yield reductions are possible. Can I thicken an old alfalfa stand by interseeding alfalfa? As stands age and become thin, producers often wonder if they can be thickened by interseeding alfalfa into them. This practice has met with very little success. In part, this is due to the very competitive environment the new seedling is placed in and in part due to autotoxic chemicals secreted by the existing plants. Researchers at the University of Missouri found that new seedlings planted within 8 to 16 inches of an old alfalfa plant had significant yield reductions (2). Seedlings within 8 inches of an old plant did not survive (Fig.2). This means that an existing stand density as low as 0.8 plants/ft2 would be enough for the autotoxic zone to cover an entire acre. Given this, along with the potential for weed competition, interseeding alfalfa to thicken alfalfa stands is not likely to be successful and is not recommended. An exception would be large dead areas, such as from ice sheeting, or failed new seedings where only young plants (less than one year old) are present. Plants that are healthy in fall and then winterkill will not release the toxins from the roots until they thaw. Even if thawing takes place during a winter warm up, little leaching or microbial degradation of these compounds will take place until spring. This means that the autotoxic effect of a winterkilled stand would be similar to that of a stand killed in early spring. There will be significant yield reductions if these stands are spring seeded back to alfalfa unless they are less than two years old. These stands should be rotated out of alfalfa, or late summer seeded following oats or some other annual crop. Jennings, J. 1999. Understanding autotoxicity of alfalfa. 2001. Proc. WI Forage Council 25th Forage Production and Use Symposium. PP110-116. Tesar, M.B., and V.L. Marble. 1988. Alfalfa establishment. In AA Hanson, DK Barnes and RR Hill, Jr., Alfalfa and Alfalfa Improvement, 303-22. Am. Soc. Agron. Monogr. 29. Madison, WI.